The Ontario Mentoring Coalition completed the development of it’s first resource – Effective Mentoring with Youth Facing Barriers to Success – in March 2016. The full toolkit can be accessed at Toolkit – Mentoring Youth Facing Barriers. This toolkit will also be available in French on April 30th. 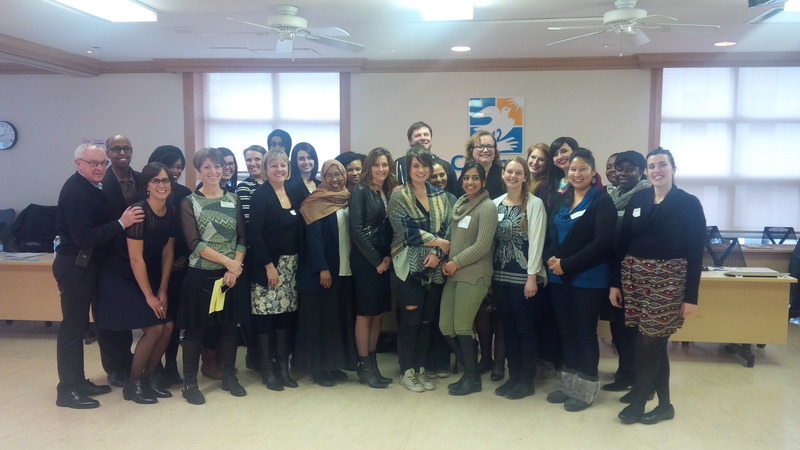 Minister Tracy MacCharles, Minister of Children and Youth Services, visits community organizations participating in the April 7th training day for the Toolkit on Effective Mentoring with Youth Facing Barriers. Webinar Recording 2 – Effective Mentoring for Youth Facing Barriers to Success. As well you can download the PDF slides from the presentation for your information. Webinar Recording 1 – Mentoring Youth Facing Barriers: Effective Recruiting and Training Techniques. As well you can download the Presentation slides for your information. The purpose of this handout is to provide practitioners a set of overall best practices that can guide the planning and delivery of mentoring for youth who experience multiple barriers to success. These practices were taken from the literature review commissioned by the Ontario Mentoring Coalition and the Ministry of Children and Youth Services. This handout provides an overview of some key tools and resources selected from the project Literature Review as particularly useful for mentoring practitioners to build and enhance their mentoring initiatives. This Facilitator’s Guide was designed with youth mentoring practitioners in mind. Practitioners can use this guide to support staff, mentors, volunteers, and youth in learning about power and privilege. In order to offer an effective mentoring program for youth facing barriers to success, it is important to empathize with their experiences of disempowerment while also acknowledging and appreciating the role a leader’s power and privilege plays in the mentoring intervention. This guide will offer step-by-step instructions on how to implement the activity and how to debrief with participants. This Facilitator’s Guide was designed with youth mentoring practitioners in mind. Practitioners can use this guide to support mentors, volunteers, or youth mentoring staff in understanding how to tailor mentoring interventions for youth facing multiple barriers to success. The activity will support participants in discussing and understanding more about specific populations of youth facing barriers and then brainstorming specific actions to work with the assets, needs, and challenges of these youth. This guide will offer step-by-step instructions on how to implement the activity and how to debrief with participants. This toolkit and the additional resources were developed with the support and funding from the Ontario Ministry of Children and Youth.